Maria’s Go-To Healthy Spots to Eat on the North Shore: Food Truck Central — Hello Adventure Co.
My number one spot on the north shore. Hands down. Don’t you love when you drive by a place that looks unfamiliar, you do a double take, pull up- and realize you just found a freaking GEM?! I almost drove right by this cute little red barn tucked away, coming right out of Haleiwa. With a farm to barn mentality Red Barn Farmstand provides fresh and very friendly portions for their customers. It became my favorite spot to grab lunch and an organic juice, which would fill me up for hours and then give me a little snack later that day. As soon as I visited I was greeted with two huge smiles by these wonderful women who immediately were there to take my order and provide me with some insight on what was great to try for my first time! To say the least I was over stimulated haha. It took me a few minutes to direct my focus because they just had SO much to offer including fresh produce and jewelry off to the side. Vegan baked goods are also always a distraction for me. That will never change. Their on-sight kitchen makes everything taste so unbelievably fresh and tasty. I ordered their Buddha Bowl and a fresh green juice. Make sure to try the freshly made wellness shot with turmeric (a little spicy, but I am into that!). I sat at one of the picnic tables outside to enjoy the view and the sunshine, they even have little umbrellas so you don’t have to sit in the sun if you don’t want to. While I was waiting, I noticed a little booklet full of instant film pictures taken by the customers and taped to the book sharing their experience at the little barn! I immediately asked for the materials I needed to make my own page ☺. When I finally got my food, I was honestly shocked. The portions were huge! Everything was seriously SO flavorful and vibrant in color I almost didn’t want to eat it at first. Snap photo. The juice was nothing less than picture-perfect and you even get to keep the mason jar they put it in for you! There is a huge space for parking in their lot and the lines are never too long. Great place for a quick stop or to linger around for as long as you desire. Okay this place is seriously incredible. A very Instagram famous spot on the island for pictures too. It is one of the cutest little tucked in spots right off the scenic Kamehameha Hwy across from the beach on the North Shore. It’s a bright yellow shack so you really can not miss it. One of my favorite things to do is grab my favorite coconut bullet coffee and walk across the street to the beach. If you’re there during the first few weeks of January, the swell is usually pretty big at the Pipeline across the way. You can watch some rad 30ft waves crash. There are surfing contests a lot this time of year. Surfing contest and coffee? Sign me up. The Papaya Bowls and the coconut bullet coffee like I mentioned before are both to DIE for. I could drink that all day every day. You’re welcome. All of the fruit and food there is super fresh and mostly everything is vegan—makes for a happy girl. Bring your friends! You all can sit at the yellow picnic tables behind the shack and enjoy the lush green backdrop while you’re waiting for your acai bowls to be made! Whenever I am on the island, I am not exaggerating- I can’t help myself! I stop here almost ONCE A DAY to re-fuel on either their kombucha on draft, acai bowls, or super healthy smoothies. 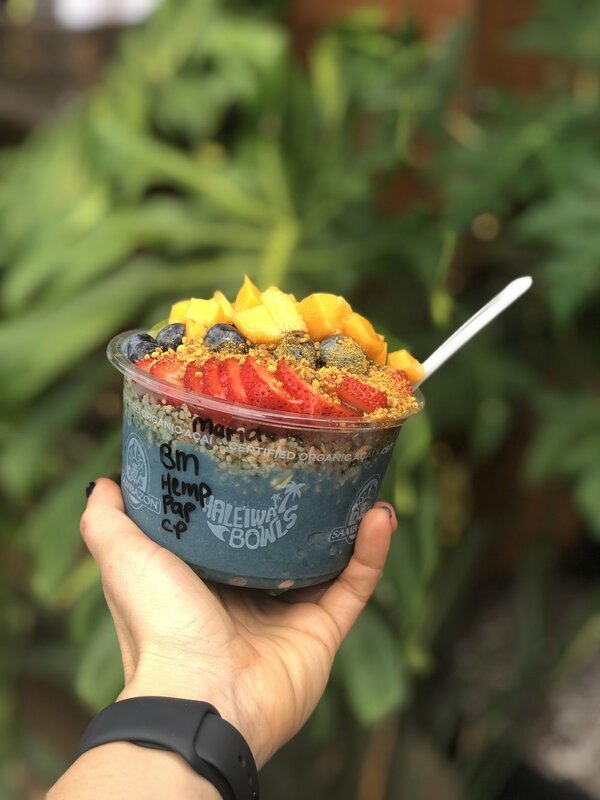 They have just about every color smoothie and acai bowl you can dream of, and all include fresh and healthy ingredients that are made to order. I always like to have a variety and switch it up on their menu. I’ll let you decide when you get there what you want to try because that is half of the fun, but know this: everything is tasty! When this is open, it’s a great authentic food truck across from the beach on Kamehameha Hwy that I definitely recommend. This place covers it all really. If you like a place with new daily specials that has a killer variety- it’s worth the wait. There is usually a line but it’s always worth it. Fresh ahi, vegan chilli, poke, steak, chicken— your mouth will be watering on the walk over from the car to the truck. Promise. I spent two weeks in Oahu exploring the island with family, went on some amazing hikes, and falling in love with the fresh local food in North Shore. If you are thinking about putting this spot on your itinerary, be sure to pin the image below!